I am so thrilled to be leading this global meditation in conjunction with Spirit Voyage Records. The world is calling out for peace, now more than ever. As yogis, it is our responsibility to help usher in the peace that our planet so desperately needs right now. Peace in the outer world begins with peace in the inner world. 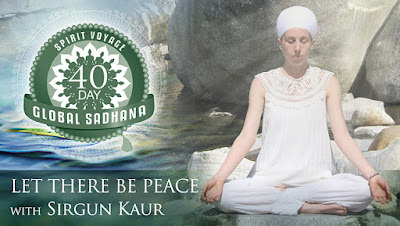 We have a huge community of yogis around the globe participating in these global sadhanas - together, we can all devote a little bit of time every single day for the next 40 days chanting for peace - for ourselves, for each other, and for our precious earth. Wahe guru! The instructions for this practice are very simple. Sit in a comfortable meditative posture with a straight spine. Many of us will choose to sit in Easy Pose - but if you prefer to sit in a chair, that is totally fine! We recommend placing your hands in Gyan Mudra, with the forefingers touching the thumbs. This mudra stimulates wisdom and knowledge, our power to compute and retain information. In this mudra, we use the index finger - which is associated with the planet Jupiter, representing expansion. Gyan mudra allows us to access a state of calmness and receptivity, so that we can access the wisdom that expands our consciousness. From this calm and receptive space, chant the Mantra for Peace by Yogi Bhajan, alternating it with the Ajai Alai Mantra for 11 – 31 minutes. It's completely free and you receive daily inspirational emails from me to keep you going throughout the 40 days!